Rhythm guitar is an often neglected and sometimes overlooked part of guitar playing. Many tend to concentrate on lead, regarding rhythm as nothing but a backing part. But despite the misconceptions that are placed upon rhythm playing, it is easily a vital part to any musical style, especially in metal. Before even starting to tackle lead playing, you should know much more than the basics of rhythm, which this guide will help you achieve. Being able to a play a solid rhythm is a much more useful talent than being able to play a sub-par lead, as rhythm is vital in any situation whereas lead is not. What makes a great musician is the ability to do what they are meant to, and well. If you can play rhythm to a good standard, then you will easily be able to build up lead playing and advance as a player. 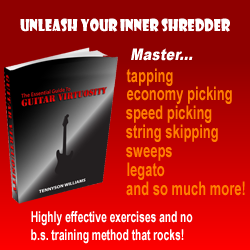 Many may believe rhythm guitar is nothing but chords and basic parts, this is rarely the case. Every player has their own style of playing lead, from Slash’s blues/rock sound to Marty Friedman’s technical metal style. This applies to rhythm playing also. If you listen to different bands, you can easily distinguish the differences between their rhythm sections, for example, Rammstein often use a marching tempo, with most notes of the same length being used to achieve this. Whereas a band such as Iced Earth focus mainly on complicated rhythms using single notes. Being able to hear these differences is the first step to achieving a style of your own. Another good idea would be to pick an influence. There is no shame in using someone else’s ideas in your playing, and by finding a band or musician that you like, then using their style to help you is one of the best ways to compose and to develop. This would be the same reason that many bands, especially those who are starting off, would cover songs. Practice songs which you enjoy. Learning from others is a perfect way to develop as a player, and with time and practice, your own style will come to you. Is it possible to master more than one guitar style?